More to come! . 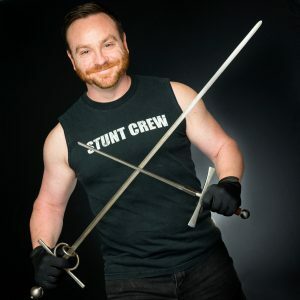 . .
Toby Minor is back with a new flair to Stage Combat! KNIVES! storytelling. Included are techniques for various actions including punches, kicks, throws, rolls and falls, and safe, close-quarter, unarmed physicality (grappling, hair pulls, choking, etc). Knife handling (slashes, cuts, stabs and wounds etc.) will be addressed in this session. Partnering skills for safety will be emphasized. All work in this class are techniques sanctioned by the Society of American Fight Directors (S.A.F.D.). Please wear clothing that you can move freely in, and closed toe shoes (sneakers preferably) and bring plenty of water. In this one-day, 5-hour course, the focus will be on what it means to be a working actor. We will cover what makes a good headshot, review resumes, and go over the “7” simple steps to a great agent interview.’ Students will practice audition etiquette and technique from entering the room to slating, to working with copy and improvising. Part of the day will focus on self-taped vs. live Film/TV auditions. The workshop is suitable for anyone with previous training and experience who is interested in pursuing acting and seeking representation. There will be one 20-minute break. Please bring a sack lunch. This class is for the actor interested in unveiling the mysteries of Shakespeare’s verse by understanding the meter, poetic forms and rhetoric Shakespeare so deftly employed. Using monologues and scene work, the students will have an opportunity to shape their character’s intentions, passions and thoughts through understanding the structure of the verse line. 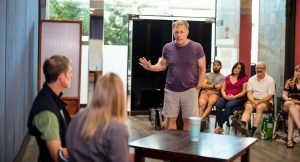 This class is for beginning to advanced acting students who may be new to Shakespeare. If you have a monologue you’d like to work on, bring to the first class, otherwise, I will help you find one. Monologues: 1 to 1 1/2 minutes in length. Class size limited to 8 students. Is your accent limiting effective communication in your professional and personal relationships? And for the actor, is your regional dialect keeping you from working? In our Accent Reduction Class, you will learn a simple, proven methodology to modify accent usage, reduce unwanted regionalisms, and strengthen overall speech. Limited to 8 students. This class is intended for anyone desiring to increase the power and impact of his or her speaking voice. Training in healthy vocal production is an essential part of speaking intentionally in any situation, from the stage or screen to the classroom or boardroom. In this course, you’ll learn a variety of techniques for preparing and utilizing your natural voice to speak confidently in a variety of environments. The first few classes will focus on active exercises designed to healthily engage the various aspects of vocal production, while the final sessions will practically apply what you’ve learned to scenes, speeches, interpersonal communication, or presentations.